Yves here. Readers reacted positively to the inaugural report by the S.H.A.M.E Project on Malcolm Gladwell. S.H.A.M.E. , stands for “Shame the Hacks who Abuse Media Ethics.” Its approach is to provide information about the background and funding sources of well-recognized journalists and pundits so that the public will be in a better position to recognize bias and hidden agendas in their reporting and analysis. This second report, on the widely-read economist Steve Levitt, overlaps strongly with NC’s beat. Note that this dossier format is the one S.H.A.M.E. plans to use for future releases. Named one of Time magazine’s “100 People Who Shape Our World,” Steven Levitt, author of Freakonomics, is generally assumed to be a harmless, quirky pop economist for trivia nerds. However, Levitt has a history of attacking teachers’ unions, advocating for the privatization of prison labor, defending online gambling and occasionally crossing over the fringe-right line by promoting climate change denialism and, some have argued, racial eugenics. A dyed-in-the-wool Milton Friedman neoliberal from the same “Chicago Boys” network that brought you the “shock doctrine,” Levitt’s idea of economics Utopia is a world in which “the market” solves all our problems and government is restricted to protecting property rights. While a PhD student at MIT, Levitt published a counter-intuitive masterpiece whitewashing corruption in politics by “proving” that corporate campaign donations do not influence election outcomes. Levitt argued that “campaign money has about one-tenth the impact as was commonly accepted,” according to a 2003 New York Times Magazine profile—a stance that helped land him a tenured job at the University of Chicago. In 1999, Levitt co-authored a paper arguing that an increase in abortion rates for black women in the 1970s was the reason for falling crime rates two decades later. “Basically, we had aborted the generation of criminals who would have been active in the 1990s,” he told Esquire magazine. His research led to accusations of racial eugenics, according to the New York Times. The study has been debunked and exposed in numerous academic studies over the years—one study by Federal Reserve economists proved Levitt used badly flawed data, forcing Levitt to apologize for the “embarrassing” errors. Nevertheless, Levitt stuck to his original conclusion linking race and crime: fewer African-American children correlates to a drop in crime. In 1999, Levitt presented a paper for privatizing prison labor at a symposium hosted by a private prison consulting firm, arguing: “I would privatize prison industry. As long as the government is in charge of prison industries, it will be difficult if not impossible to avoid decisions being made with political rather than economic justifications.” Thirteen years later, Levitt’s privatized-prison-labor dream is a reality: Some 1 million state inmates are slaving away for wages averaging between $0.93 and $4.73 a day. African-Americans make up over 40% of the U.S. prison population. In 1995, Levitt published a paper which “proved” that packing prisoners into increasingly-overcrowded prison cells translates into a net $15,000 positive effect on society per overcrowded cell inmate. Levitt is a paid corporate speaker regularly hired by investment banks, financial services companies, venture capital firms as well as various anti-labor “human resource” outfits. One corporate union-busting association, the Society for Human Resource Management (SHRM), gushed over Levitt’s performance: “We received numerous compliments about your remarks from our attendees, well over 500 participants . . . We applaud the valuable work that you are doing.” Recently, SHRM opposed legislation that would have made it easier for workers to join union and lobbied to defeat a law that would have protected women against gender-based wage discrimination. In 2011, Levitt published a paper proving that poker is a game of “skill” and not “luck,” and used the Freakonomics website to advocate for legalized online gambling. The Chicago Tribune noted that Levitt’s support for the industry coincided with a federal crackdown on online gambling companies for fraud and money laundering, noting that Levitt’s “research could not be more timely.” Levitt did not disclose his financial relationship with the online gambling industry, which included working to develop a set of tools to catch cheaters for an online poker company in 2007. This entry was posted in Guest Post, Social policy, Social values, The destruction of the middle class, The dismal science on June 8, 2012 by Yves Smith. Levitt’s idea of economics Utopia is a world in which “the market” solves all our problems and government is restricted to protecting property rights. 3) a lender of last resort. 4) legal tender laws for private debts. Also advocate that the government itself provide a risk-free fiat storage and transaction service to DEPRIVE the banks of our money to play with. This battle is between the banks and the rest of us. Banking is a cancer that must be removed carefully but it must be removed nonetheless. >> restricted to protecting property rights. If propertarians don’t want government to protect people in other ways, then I don’t want government to protect property rights either. My Chicagoan hypothesis is: a free people will choose more effectively than government whose property rights are worth defending. Of course anyone genuinely concerned about property rights would be concerned with just restitution when a theft has occurred. Those most acutely sensitive to the need for property protection are those who have benefited from theft themselves? How about a debt jubilee? Credit creation cheats non-debtors too. Plus a universal bailout fixes everyone in nominal terms (including the banks) and if combined with a ban on further credit creation and metered appropriately could be done without significant price inflation risk either. then doesn’t bankruptcy solve individuals’ debt problem? Does losing one’s home solve one’s problems? A home that was built with one’s own stolen purchasing power? …should be concerned that everyone have *equal opportunity* to participate in markets and collect property rights. But, as I’ve learned from propertarians, they ally with republicans in opposing measures to ensure equal opportunity for minorities and women. Ah, a ray of Sunshine! The online equivalent of the much missed “Sunshine Laws” of a few decades ago. Thanks to one and all for doing the legwork. Now if only someone could talk Yahoo or Google into making a Wall of Shame part of that generally nauseating Online Newspaper they all throw in our faces. I love the “Wall of Shame” or worst offenders list approach as well. Like it or not, this sort of thing is effective. Perhaps it is bumper sticker mentality, but that is what works in the US, and sadly, increasingly elsewhere as well thanks to one the few great successful American export industries – manufacturing consent. I’ve seen American style propaganda used liberally here in Taiwan for years now. Thanks Mad Men! The link in this statement is to the site lifenews.org. I would expect high quality debunking to source original work and not rely on the work of other journalists whose partiality is obvious. Not credible…That’s all you have? Abortion may prevent the birth of “unwanted” children, who would have relatively small investments in human capital and a higher probability of crime. On the other hand, some research suggests that legalizing abortion increases out-of-wedlock births and single parent families, which implies the opposite impact on investments in human capital and thus crime. The question is: what is the net impact? We find evidence that legalizing abortion increased murder rates by around about 0.5 to 7 percent. Previous estimates are shown to suffer from not directly linking the cohorts who are committing crime with whether they had been born before or after abortion was legal. Is that the same John Lott who is really Mary Rosh in drag? There are good reasons to incredulous of Leavitt’s thesis. The FRB paper by Foote and Goetz is good, but the working paper by Lott and Whitley is an abstract with a dead link to the paper and data. The James A Fox blog from the Boston Globe Has a chart with no reference to the data source. Grizz, you are now changing your original objection, which shows bad faith and classic troll behavior. You originally raised an objection arguing that in your opinion the link was not credible enough to prove several academics had done studies debunking Levitt’s abortion-crime argument. Now that several reports have been shown to you, you’re now making a totally subjective argument that in your opinion, those don’t debunk Levitt’s argument. So now you’re arguing about the quality of the objections rather than the existence of them. Clearly you’re looking for a reason to defend Levitt at any cost. So, obviously then you agree that massive increases in black abortions leads to corresponding decreases in crime, right? Grizz, you’ve taken up the same cudgel I tried to swing last night and gotten the same flavor in reply. The exposure of bad faith in media pundits is fine by me – and I assume by you as well – but the faint rigor of these pieces undercuts their putative intent. I begin to wonder if they’re not meant ultimately to sabotage any solid critique of these same figures. Whether or not that’s the project here, it’s likely to be the result. So like SHAME is some sort of gatekeeper site? Or is “false flag” the word I’m looking for? No…it’s something else. One thing’s for sure: it’s funded by George Soros. If blacks were worse than other humans then surely the Bible should have warned us? But it doesn’t so I guess we have to look elsewhere for the problem. How about the credit system which steals purchasing power from the so-called “less credit-worthy” (disproportionately black?) for the benefit of the so-called “more credit-worthy” (disproportionately white?) ? Non sequitur. The Bible doesn’t warn us about a lot of things. Even if you believe this particular work of tribal myth is divinely inspired, the Bible isn’t an encyclopedia of useful facts. Stop trying to use it as one. That said if the Bible fails to include racist subtext (along with all the women hating and slave holding) that is surely one of its few virtues of omission. I don’t see women hating in the Bible – even in the Old Testament. As for slavery, it was Christianity that eventually abolished it – temporarily it seems. Don’t be bitter. The Bible convicts us ALL of sin and who can deny it? THere is nothing in the Babble against slavery, and Christians have profited enormously from that institution. As Stephen Haynes notes in Noah’s Curse: The Biblical Justification of American Slavery. (Oxford University Press, 2002), the 1864 general assembly of the Presbyterian Church in the Confederate States of America affirmed it was the mission of the Southern Church to conserve the institution of slavery, and to make it a blessing both to master and slave. Grizz, dontcha hate when that happens? You think you find a way to discredit something that damages a brand that needs protecting– in this case you think you’ve found proof that there weren’t several studies debunking Levitt’s abortion paper–and then, wham! Some bastards come along and provide numerous links, blowing your game. Karl, you may of course run down comments and commenters as you like, but some here – myself among them – appreciate skepticism applied even to the defenders of views we happen to share. Clearly, though, that’s not how you roll. So you “appreciate skepticism” but object to skepticism about skepticism? That’s called selective-skepticism. Interesting. “Like those who are criticizing us, we believe that rising global temperatures are a man-made phenomenon and that global warming is an important issue to solve. Where we differ from the critics is in our view of the most effective solutions to this problem. Meaningfully reducing global carbon emissions has proven to be difficult, if not impossible. This isn’t likely to change, for the reasons we discuss in the book. Consequently, other approaches represent a more promising path to lowering the Earth’s temperature. The critics are implying that we dismiss any threats from global warming; but the entire point of our chapter is to discuss global-warming solutions, so obviously that’s not the case. Interesting, thanks.. These “SHAME” pieces do seem a little off somehow.. Maybe hastily compiled or not entirely in good faith. Also, I have not signed on with the fervent believers in man-made global warming. Here’s why: I’ve seen leftist critiques of its ideological and propagandistic roots that I don’t see addressed by others on the left. Also, laypeople shouldn’t read a few popularized articles and suddenly assume they’re qualified to lecture everyone else on their scientific ignorance, it’s absurd. Especially given the institutional critiques of science from critics such as Thomas Kuhn and many others, who show that social politics (among other problems) can infect “science”, and it’s all tentative anyway, subject to potential revision later. It looks to me like it’s simply not in good faith. I guess the of SHAME would say: “We know what he’s trying to say.” But that’s really a terrible justification to imply Levitt wants to socially engineer outcomes by culling America by race. Cross-country and cross-state data leads you believe abortion played a large role. Publish that, and you get called a racist. Levitt leaves out a lot of steps in his long, tenuous argument. He’s not providing good science. There’s a much stronger case that crime rates dropped because lead was removed from gasoline. Tetraethyl lead inhalation is known to make people violent and paranoid, as well as stupid. The “unexpected” drop in crime rates correlates tightly with the point when the children coming of age had no longer been exposed to lots and lots of lead fumes. So how has that hypothesis been tested? What are some countries that kept lead in their gasoline and if they removed them, did their crime indeed drop 18 years later? I’ve read that study; It is REALLY solid. Across a large number of countries with very different onset dates of when they changed the regs. The correlation is tight and they also show how other commonly cited causative factors don’t fit the data very well. A researcher, Jessica Wolpaw Reyes, who found a strong cross-border link between lead and crime (and this is much more important than the time-series correlations often pointed out) also found a strong link between abortion and crime (as strong as Levitt’s link as it turns out). I meant to say that Wolpaw Reyes found that the link between Abortion and Crime as strong or stronger than Levitt estimated. I don’t know which factor (abortion or lead), she found to have a higher explanatory value. So its all good if its class and not race? Let’s say you were a researcher who found this link. Just pretend for a second that it’s plausible that he’s acting in good faith. How would you go about explaining it? Class provides a natural — ‘natural’ in the sense meaning that it exists without the researcher having to deliberately set it up, which would be unethical — experiment to test certain types of hypothesis. b) the behaviour is a product of the environment and circumstances of the class — and by ‘product’ I mean that such behaviour is a viable and effective survival strategy. If there’s some social mobility, so that people can move between classes, then that provides a natural test to decide between the two possibilities. Allowing for generational lag — that is, someone raised in one class will continue to display some of the behaviours learned in that class, even if they move to a different class, but their children will only have experience of the new class conditions. If the children display the same type of behaviour found in their parents’ class of origin, then that supports the first interpretation, that the behaviour is a result of a natural predisposition. If the children display behaviour typical of the class they grew up in, then that supports the second interpretation, that the behaviour is a product of environment. Based on what I remember reading in Levitt’s book, he argues that criminal behaviour is a product of the environment in which the individuals were raised and that the fall in crime rates is the result of fewer individuals being raised in that environment. Basically, in the nature versus nurture question, he’s coming down on the nurture side, at least for criminal behaviour. Criticism the position as if it’s arguing that criminal behaviour is a result of nature is deeply dishonest and misleading. THe hypothesis may not be correct, but criticisms should be directed at what it is, not some fantasy version concocted by those just seeking to smear the person who advanced it. Nick, nice try trying to pretend that Levitt didn’t explicitly link increased black abortions with lower crime rates. 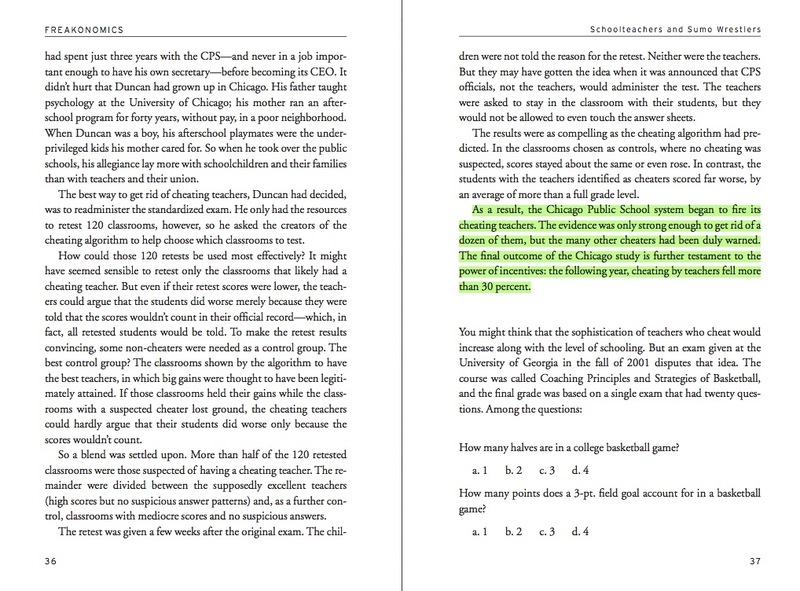 These things are different (a) the chapter in the actual book and (b) their follow-on blog post to address criticism. Anyway, the whole point was to say, if global warming is occurring, common carbon mitigation practices will be ineffectual at best and counter-productive at worst (if indeed, we’re talking catastrophic consequences to warming.) Beyond that, they’ll be hugely expensive. They propose that human ingenuity can solve the problem simply and efficiently through geo-engineering. I don’t know if it would work, but it all seemed plausible if your only goal is to stop the warming trend. No, geo-engineering won’t work. The biggest problem with CO2 emissions is ocean acidification and there’s no geoengineering method do deal with it. We need to halt fossil fuel burning, period. Given how long the problem has not been dealt with, we will probably need to do other things too, but we *must* halt fossil fuel burning if we want humanity to survive. I really can’t even recall how they respond to ocean acidification. They say they do. This is all far out of my area of expertise…. Also, carbon emissions reductions are cheap, so that’s another thing Levitt is just lying about. Presumably the oil or coal companies are paying him to lie; otherwise, he has no excuse. Levitt is clearly carrying water for the fossil fuel industry. As usual with right-wingers, Levitt lies about his own previous statements. He *did* deny that global warming was caused by manmade CO2 emissions; now he’s backed off on that. But more importantly, Levitt’s new line is just the fossil fuel industry’s “backup propaganda” — claiming that it’s too expensive to reduce CO2 emissions and instead we should just live with it, or do some preposterous and technically impossible thing. This has ALSO been debunked, long ago; the cost of reducing CO2 emissions is tiny (except to the fossil fuel companies), while the danger of not doing so is astronomical, and could fairly easily lead to the extinction of humanity. Levitt is not writing in good faith. He’s spouting the propaganda push of his paymasters. Yeah, he’s not against global warming at all. How could he be, after all he only called global warming a “religion” in SuperFreakonomics. I’ll repeat for the troll-deaf among you: U. OF CHICAGO ECONOMIST STEVEN LEVITT CALLED GLOBAL WARMING A RELIGION. It’s out of context, but it’s Levitt’s fault for not putting “religion” in quotes. So one out of context quote. You can have the point if you want it. Nick, you’re just plain silly. You need to hone your trolling skills, you lost your game way too early on this and it’s just sad at this point. Freakonomics is Creepononics. Something very smarmy and smug about that Podcast rubbed me the wrong way. Now I know what it was. Thanks. The books and stuff are interesting, but I too have noted the smugness. I think observers are generally tempted to feel superior to those that they observe. Uhh….he doesn’t even advocate SOPA in the link provided. He asserts that government should protect property rights and makes no specific recommendation about how that should be done–SOPA or otherwise. In fact, he applauds the Congresswoman’s point that it should be an economic matter rather than a criminal matter. So saying he wants “more people locked up to protect property rights” is dubious. I would submit that he’d criminalize far fewer “crimes” than most of the population. On the overcrowding issue, he’s not making a case that we should lock more people up either. He’s saying that releasing criminals increases crime and that social costs increase over and above the cost to house them. That doesn’t strike me as too controversial of an opinion. Would releasing criminals increase crime? Yeah, probably. He was simply disentangling the economic impact of the policy. That doesn’t strike me as too controversial of an opinion. Of course it doesn’t, you’re a Levitt fanboy. On the other hand, try this for a change. I’m personally of the belief that we lock up far too many people (20% of the prison population despite only 5% of world’s population) and we should look at releasing non-violent offenders, but providing a counter study, doesn’t mean that Levitt’s study is without merit. Levitt was looking at the specific policy related to releasing prisoners based upon overcrowding lawsuits and is thus a bit narrower than the point of your article. We do spend far too much is locking up huge swaths of our population, but again, I don’t find Levitt’s observations offensive in the least. Made a mistake in the above. Levitt uses the instrumentality of Prison Overcrowding Litigation to control for some variables that he believes other studies have missed. So he is making a larger point. That locking up more people would be positively correlated to less crime. I disagree with the policy implications of such a study. Previous studies of the impact of changes in prisoner populations on crime rates have failed to adequately control for the simultaneity between those two variables. While increases in the number of prisoners are likely to reduce crime, rising crime rates also translate into larger prison populations. To break that simultaneity, this paper uses the status of prison overcrowding litigation in a state as an instrument for changes in the prison population. Overcrowding litigation is demonstrated to have a negative impact on prison populations, but is unlikely to be related to fluctuations in the crime rate, except through its effect on prison populations. Instrumenting results in estimates of the elasticity of crime with respect to the number of prisoners that are two to three times greater than previous studies. The results are robust across all of the crime categories examined. For each one-prisoner reduction induced by prison overcrowding litigation, the total number of crimes committed increases by approximately 15 per year. The social benefit from eliminating those 15 crimes is approximately $45,000; the annual per prisoner costs of incarceration are roughly $30,000. Prison overcrowding is in fact likely to be correlated with higher crime rates, because prison overcrowding is associated with an untrustworthy and irresponsible government, and untrustworthy and irresponsible governments naturally cause higher crime rates (because the “government” is the one passing the laws, and people are less likely to respect the laws if the govenrment is untrustworthy and irresponsible). So Levitt makes bad assumptions right off the bat. He’s a crummy excuse for a scientist. That’s interesting. I suppose it implies that we have the most untrustworthy government in the world. Maybe. I think we criminalize far too many actions that shouldn’t be criminal in a free society. You made the claim that Levitt’s abortion-crime paper avoided linking aborted blacks to lower crime rates. You were replied to with evidence from Levitt’s paper in which Levitt explicitly linked aborting black babies in the 70s to the sharp decrease in homicide crimes in the 1990s. Levitt based abortion-crime paper on race. Somehow you missed that. Please explain why you misrepresented Levitt’s paper as a way to discredit this SHAME report, or explain how the quote from Levitt’s paper does not link aborting black babies to lower crime rates. If you don’t respond to the quote from Levitt’s paper, you’re clearly just trolling. test….replies don’t seem to be populating. If you wave birth rates by cohort and crime by cohort, you can isolate effects of abortion and estimate its effect Or he’s advocating a policy to wipe black people off the face of the earth. One of those two. If you have data on birth rates by cohort and crime by cohort, you can isolate effects of abortion and estimate its effect. Unfortunately, cohorts are often racially based. Or he’s advocating a policy to wipe black people off the face of the earth. One of those two. Yes he does. He advocates it by saying that he agrees with the opinion of (Bush economic advisor) Mankiw on the matter. Uh, excuse me, “we don’t leave it up to civil litigation to protect property rights”? M-kay, let’s see. Real estate: disuptes over ownership, rentals, foreclosure, etc. — private civil litigation. Copyrights, Patents, Trademarks: disputes over ownership/breaches/infringements — private civil litigation. Oil drilling rights? Mining rights? Do you really need us to spell it out? Except for eminent domain cases where the state is taking private property against the will of the owner, all property rights in this country (physical property as well as intellectual property) are challenged and defended in PRIVATE CIVIL LITIGATION. Unless I am missing something, this statement by Levitt by itself should result in his credibility being struck from the record of printed and spoken matter. Actually, pretty much agree with you on this. I’m not an advocate of SOPA. I’m not for deputizing private corporations on behalf of other private corporations to go after (in many cases) private citizens. But even if Levitt agrees with Mankiw’s poorly argued point, it still doesn’t make him for SOPA ;-). SHAME got quite a bit wrong on this. Uh, excuse me, “we don’t leave it up to civil litigation to protect property rights”? I hope there’s a typo somewhere in here. Otherwise . . . Sorry about dupe post. First one didn’t seem to have gone through. ERRATA: The subject statement about property rights was by MANKIW according to the quote. Apologies to LEVITT, who hopefully does not adhere to MANKIW’s inaccurate statement. Mankiw didn’t even argue for SOPA in the attached link….he says he’s not educated on SOPA, but that we need a framework for property rights. Levitt doesn’t opine on SOPA either, but I would imagine he wants a framework as well. Mankiw is apparently unaware that under the framework of USA law (and in every day reality in the USA) property rights are enforced in private civil litigation, except in eminent domain proceedings where it is the state that sues to take someone’s property. It is hard to take anything he theorizes about seriously, given his apparent lack of basic facts in the area that he theorizes upon. Your expertise in blowing smoke will not get you far unless you are working for . . . well, maybe a political campaign operation. Our imagination is the best we have. Levitt’s point is rather generic. I still don’t see him advocating SOPA anywhere per original post. As prolific as he is across the interwebs, I would think a direct link would be simple to find. Nick, isn’t it past your troll time? Your arguments are getting sloppier and sloppier. You say that just because Levitt agrees with Mankiw’s opinion that SOPA is a good thing—that it is not an attack on freedom of expression but actually protects expression—Levitt does not actually agree with Mankiw that SOPA is a good thing? He says yes, but actually means no? difficult if not impossible to get them out. What do you mean “despite”? A market requires the exchange of goods and services; if someone is just taking and giving nothing in return — which is what piracy is — that’s not a market, that’s pillage. Supporting SOPA is one of the things Levitt got right. But, of course, since it doesn’t go along with what’s revealed to be Yasha Levine’s pro-slavery agenda, it’s condemned. Whether it’s the earnings of creators and performers worldwide or the pensions of public employees in the US or the wealth and well-being of the citizens of Greece, there seems to be global move to destroy the livelihoods and security of working people. And, rather than the victims standing together and supporting one another, we get this sort of crap where some workers try to preserve what they’ve got by throwing other workers to the wolves. Only the wolves win that way. Dean Baker has a better reasoned view of our absurd IP rights regime, of which SOPA is part. Sorry Charley. Dean Baker has a better reasoned view of our absurd IP rights regime, of which SOPA is part. Dean Baker suggests Artistic Freedom Vouchers as a way of supporting creative activity. These artistic freedom vouchers would be funded by a tax and administered by the government. Given recent developments, where people voted to reduce the pension of public employees in San Diego and San Jose because they didn’t want their taxes funding those pensions, and the routine attacks on anything and everything administered by the government, I see Baker’s proposal as just an incremental step towards imposing slavery rather than the grand slam advocated by the pirate movement. They both end up in the same place, it’s just one takes a little longer to get there and so seems a little more reasonable. If you don’t want people to read and share your book, don’t publish it. If you want people to read your book but want to force each of them to pay you, and want government thugs to assault people who don’t pay you — then I don’t want to read your book. If you don’t want people to [use] your [product or service], don’t [offer] it. If you want people to [use your product or service] but want to force each of them to pay you, and want government thugs to assault people who don’t pay you — then I don’t want to [use your product or service]. You really do sound like an antebellum plantation owner who grew up with slaves doing things for them, but is now outraged — outraged! — to find that those slaves are called “servants”, “staff” and even “independent tradesmen” and that they are expected to pay — pay! — them rather than just enjoying the products of their time, skill and labour for free. And, what’s worse, if they use the product or service and don’t pay for it, a bunch of Yankee thugs from the government of Northern Occupation will come around and assault them — assault, of course, meaning serve them writs and take them to court. The pro-slavery agenda is strong in you. Do you also have rants about “greedy public servants” and “lazy Greeks, dissolute Spaniards and incompetent Irish”? SOPA and PIPA are/were all about “Control” ..and eventually TPTB got their way via CISPA anyway (ugh!) — immunity granted to Telecoms for being snitches by *Unlawfully* violating 4th amendment principles et al ..all for the purpose of squashing dissent. Seen the secret NYPD/Goldman/Fed setup in manhatten? Anyways, it’s all about the State initiating force! — How come the State is allowed to initiate force, steal property, kidnap people and throw them in cages, yet i cannot? (not that i want to) ..and you prefer to have the Agents of the State enforce *Unlawful* legislation? So please, kindly take your pro-slavery notions elsewhere..
Well, boy and girls, Levitt is a Virgil in the underworld of the dysfunctional US economy, an economy that can no longer produce sufficient jobs providing a living wage (Nor will it for at least 20 years, at current course and speed.). Follow the arc of his career, and you too can do well. Make millions while your erstwhile classmates, friends, and family members drown in debt, languish in underemployment or joblessness, suffer homelessness, depression, despair, suicide. Piss on their inert bodies on the sidewalks as you return to office from the four star restaurant where you enjoyed lunch. And never, never stop stealing from the miserable, debt slaves you and your class have consigned to wretched servitude. It’s the New American Dream. Just ask Steve Levitt. It’s the Chicago (School of Economics) way. The only problem is, it doesn’t work against zombie banks. Thats an old game. In the late 1800’s early 1900’s makers of “sporting” firearms were cranking out “elephant guns”. these were handheld artillery that loaded shells 4 to 6 inches long and fired bullets up to 3/4″ in diameter. Not many rubes in Kentucky, Ohio or Nevada were ever going on an African hunting trip, not mention that the African elephant was by then already being driven to near extinction. Later in the 1920’s the Thompson Submachine gun,the “chicago typewriter” would be market as the latest advance in “sporting”, and this was a brabd new twist “self defense” armaments. “Deregulated human-organ commodities exchange….” Not to extrapolate in a paranoid fashion about a “mandate” to participate in a marketplace, but…. Now why didn’t I think of that first? (Smacks forehead). It’s the ultimate free market free-jack innovation. Buy in now, before the OrganBook IPO pump-and-dump is offered to the rubes. On reading about my fellow Americans (even at times the comments) here and on other sites (and with respect to the Wiscon election), it is easy for me to conclude that Americans are the dumbest, the most shallow, and the meanest on the face of the earth. Quite an accurate assessment, especially when it comes to the duped masses. It’s because we have the worst, most biased, most corporate-controlled, most dishonest, media in the world. Starting at the top with Faux News. But right down to your average daily paper. They’re all crap. Are you kidding me? I watch Faux news non stop and universities as well as collages wont accept me because they say im to smart and they have nothing to teach me which is why I will be richer than Bill Gates someday. I am no fan of Levitt and the whole Freakonomics enterprise – as has been noted above, the smugness is off the charts, and the arguments are (dare I say) Gladwellian in their desire to frame pro-business/antiregulatory arguments as somehow counterintuitive (and thus “rebellious”). Where Gladwell trolls second-hand sociology to get to his “arguments,” the Freaks use selective econometrics. But in all fairness, I had to read his paper on the cheating by public school teachers for a course on education and labor economics last year and found it to be quite good. I was prepared for the opposite given my opinion of Freakonomics, but the paper is well-argued and reaches a conclusion that I think would resonate with a lot of NC readers, namely that excessive reliance on standardized testing narrows the incentives for teacher performance in a way that heavily incentivizes cheating. The authors do not argue that this is because of unions, nor do they say that teachers in general are mooching public employees – these are the political ideas that we might expect to see there, but they are not in the paper at all. Did we really need a “study” by Levitt to figure out that teaching to standardized tests incentivizes cheating to meet the benchmark? This is the type of nonsense that gives sociology and related pseudo ologies and onomies (e.g. “economics”) a bad name. If a University of Chicago economist admits to a bias against teachers’ unions as Levitt has, then devises a scheme by which to fire these same teachers and even brags about it in his book, I think anyone with an iota’s sense of labor history understands very clearly what’s going on here. If you think Levitt’s method for firing teachers is an innocent disinterested intellectual exercise, boy have we got a Florida charter school diploma to sell to you and your kids! “We” certainly don’t – as I said, that conclusion wouldn’t be a big surprise to anyone here at NC – but you can be sure that the policy debates that matter draw heavily on data-driven studies like this. So whethert those debates are based on creepy crawlies, heebie jeebies or oogly booglies, that’s the framework they operate in. What I took away from the SHAME report is the more important point that the studies are used politically, and in ways that far outstrip their data analysis (which is itslelf often deeply flawed – I have seen plenty of takedowns elsewhere that go beyond the information summarized above to attack their econometrics). But I wasn’t addressing that – my point was that I don’t recall any of that *in the paper itself,* which is different. If I were, then I would certainly need to do that, but of course I was not. My comments were limited to the content of the paper itself, which (given my comments about my antipathy to Levitt, which you conveniently ignore) I found surprisingly free of the bias one would expect. In short, you’re tilting at windmills here – I am in no way a Levitt apologist, and have in fact written a great deal in other setting about the idiocy of school privatization. I think my mythical kids will be just fine thank you. One wonders if the percentage of “studies” on which the anti-public schools juggernaut is based is 100% junk versus 99.9% junk. In any event, I would find it embarassing to be wearing the epaulets of a Harvard scholar while churning out junk science like this in the service of such a ruthless and destructive agenda. Why doesn’t Levitt? Ah, Permanent Mayor Mike (I’m a fellow New Yorker) – I wonder whether his decision to centralize his control over the city’s schools under the roof of Tammany Hall will be noted appropriately for its irony when the history of his artificially extended term is written. Likely by a Bloomberg columnist, of course. Did you read that horrible column his school Czar Klein wrote for the Atlantic last year? It was masterpiece of the genre of complain-bragging in which teh dastardly and all-powerful Randi Weingarten was somehow the source of all things evil, having blocked Klein’s lonely, heroic crusade to blahblahblah. I will stick my neck out here and say that the problem is not all, or even mostly (at least in my opinion) the studies, but rather their interpretation. It’s easy to point out the absurdity of the assumptions in economics papers – particularly those having to do with macro, or with financial markets – but papers in labor economics (for whatever reason) tend to be more empirical and grounded in both their assumptions and their use of the data, and as a result are more realistic. The bigger problem is when the authors leap beyond the data analysis to arrive at overly broad, market-friendly conclusions, which does happen too often (cf the “skill-biased technological change” canard, which began as nothing more than a stretch – by a Chicago guy, no less! – to explain the residual/error term in a regression). But the biggest disconnect is that even when the economists don’t leap to such conclusions (as I don’t remember Levitt doing in this case), the papers end up being used that way anyway in policy debates, and ironically, the more definitive (and non-junky) the paper, the more likely it is to be abused in this way. Doing that allows policymakers and partisans to argue from authority in the hope that the other side won’t have read the paper, and can’t refute their use of it. So in this case, for example, it sounds from Levin’s study as though the paper was used to bash teachers’ unions, even though the conclusions it reached actually pointed in the opposite direction more or less, or away from standardized testing. I don’t see a way past that in this environment of truthiness. As for why Levitt isn’t embarrassed by his activities, I think the success that doing so has brought him speaks directly to your question (as does Yves’ book, in much more rigorously argued detail). Here’s hoping Mayor Mike and all he represents go away at the end of this term. Well, PMM will be gone if CQuinn doesn’t succeed him. There are folks working on the true story of Bloomberg’s “education legacy” (not me). It will be an interesting contrast to the Monument to Mike that is currently in the works by unknown writers but with the very active assistance of all Commissioners, Deputies and god knows how many other City employees whose sole job for the last year has been to gather facts + stats about all of this great achievements during his eternal reign. (Pretty sure nobody is collecting and analyzing his helicopter take offs and landings from the East Side helioport :) ). Thanks for that. If enough economists started standing up publicly , economics as a profession might start down the road to renewed respectability. That gets more to your thoughts on what kind of professional circumstances could produce someone like Levitt. I think it also sheds some light on the intense institutional pressures for ideological conformity *within* the discipline, which is extraordinarily concentrated in terms of the sources of power, prestige, funding, etc. I’m not in that profession so I can’t say, but it’s not hard to see how that kind of pressure could result in the internalization of a lot of market friendly ideas as professionally (if not always scientifically) “correct.” And all of that is before the involvement of politicos, corporates throuh funding, etc. Thank you for the heads up on the concurrent discussion, will pay visit with great interest. The Card story depressingly confirms what is becoming increasingly clear doesn’t it. So tenure in the Ivy League should be abolished? Just being consistent. Leonova, what do you mean? Not being fly or rhetorical here. I always find your comments most interesting and eloquent! Your concrete, profound revelations now in the world of “Economics + Politics” constitute Good Works in the purest sense. Your high quality of truth-telling in the domain of your expertise is a great contribution to humanity. Walk forth. The Boy Who Cried Wolf. And all the other astroturf. The good part is the ending when he and they have lost all credibility. However it was and is tragic that it is the sheep who get killed when trust is broken and can’t be put back together. So public policy should have a regulation for that. Oh, I forgot, this is America. BRAVO! Now we’re into the substance of this project, if the coming profiles are to be like this one. Malcom Gladwell is an entertaining clown. Hes a Hack, and the Michael Crighton of editorial writing. But with Leavitt we’ve crossed over into pure neo-liberal evil. This is one of the true party apparatchiks. A liar of the Roland Steinacker mold. Curious cynics want to know. Yeah, I’m not a Levitt apologist either, but for some reason oooo this Levitt takedown exposing him for being a scumbag makes me sooooo mad. But hey, I’m not a Levitt apologist. Curious cynics might want to pen their rants when their rational brain is not swamped by the reptilian sections — amazing things might happen like full sentences without words missing, or a message worth reading. P.S. This was meant as a reply to AndyC, not NotALevittApologist, though I think it is clear from context. This gets right to the heart of the problem. The why-Americans-vote-so-dumb problem. A lot of these people rishing to “defend” Leavitt, who arent quite sure even why, just have a gut feeling that the lies and advertising they have bought into lock, stock, and barrel are not actually sound reasoned arguments. They are reacting like someone who bought a valuable antique, and someone has just pointed out that it has made in Taiwan stamped underneath the tiffany label. NO!!! you LIE!!! yes i can see it with my own two eyse but you still LIE!! how many times have you heard this kind of reaction in a “political argument” with the average American? Is this not how they always react when the manufactured “beliefs” are challenged? Too many and for too many of my adult years and most importantly, on both sides of the aisle (R/D, whatever). That is the level of “discourse” that keeps the fake 2-party (Obomney/Robama) framework in place. Fortunately we have places like NC, Jesse’s Cafe, and Hugh’s blog at Corrente as oases of learning and engagement. I had considered Levitt a harmless charlatan doing pop science. It is useful to know that he is something more, and less benign. I still think these kinds of exposés can be written about any of the figures in our media as well as quite a few of the faux progressives of the liberal blogosphere. This S.H.A.M.E initiative is illuminating. Go on Yves. Just like with Gladwell, part of the success of these right wingers over the past few years has been based on packaging old-fashioned laissez faire to look cool, quirky and “freaky”. In terms of economic impact, the smothering at birth of Jamie Dimon might have prevented the Trillions in coming losses. But a civilized society, hopefully, does not debate such matters. The fact that we now debate Torture, the economics of prison/slave labor and similar topics says a lot more than the specific arguments made by either side. How small are we to become? Till we realize that the system is not JUST as we supposed but crooked? Is that not the message of Occupy? That something is wrong even if they can’t put their finger on it? These people are educated with this idealogy and there is a methodology to their madness. They are paid well to promote the NWO agenda and try and make the masses believe their big lies. CNBC just had one of these “people” on Closing Bell saying there is no recession. Right before that my son came home from work and said he sees more and more people panhandling. He said he gave half of his sandwich to a 20 something year old girl who was panhandling. Speaking of panhandlers, CNBC just reported that FHA needs a bailout. These FED and Wall Street crooks need to be forced to PAY US BACK…and then they need to go to prison. 3 felonies=life in prison. The guy is a mental midget, and an economic flyweight. It not about meeting demand for body organs – it’s about increasing demand. There are many ways to do that, and I’d like to show how my shiny new trans-global corporation called International organ Harvester might operate in Gary Becker’s world. In establishing reputation, let me briefly show the great lengths we go through to ensure our organ supply chain meets any demand, always with the greatest variety and using only the freshest organs. We are a network of regional hubs, with each hub strategically centered on an airport, and extending out to a one-hour flight radius. We do not wait for traumatic events to secure our organs – only buzzards and our competitors do that. We choose to purchase our organs when they are still alive. The homeless, the mentally ill, and the addicted are eager to assign rights to their organs for $100 on the spot. To protect our investment, those given money will have the terms discreetly and legibly tatooed on their bodies, and will be augmented with a sub-dural ID chip. These people are free to keep their organs until a harvestable event is deemed to have occured. Once an organ is harvested, IoH is not under any obligation with regards to the remaining portions of individuals. In practice, though, we will typically maintain the indiviual at some metabolic level, stored on one of our airplanes/flying operating theaters to deliver just-in-time organ replacements to paying customers. Our client services certainly meet the needs of the traditional trauma and last-chance markets, but we do so much more. Just by virtue of having the widest selection of organs and organ sets available in under one hour, transplants are now a viable option for the treatment of many diseases. Why put up with unsightly weight gain when a new stomach might be just the ticket to finally eating less. Soldiers are more apt to enter hot fights with greater confidence knowing major damage is no longer the threat that it once was. >> The homeless, the mentally ill, and the addicted are eager to assign rights to their organs for $100 on the spot. Just more ways for the 1% to exploit the 99%. In this case, the bottom 5% have nothing to offer the 1% but their very organs. And the desperate will be offering them for a fraction of what they’re worth and will short-change their health for very short-term benefit. Rather than “mining the poor”, the people advocating for this should put more of their money into creating new organs out of stem cells (or whatever). That is a better long-term solution. It will help everyone. And the technology is JUST around the corner, too. Talk about “blood diamonds”. There’d be an international flow of organs from poor to rich countries and from poor citizens to rich citizens. Boy! to call this guy dirty would be a pretty severe cut on dirt. Even if Levitt is evil and hates teacher’s unions, IF he actually came up with some kind of method that caught some teachers cheating on standardized tests I applaud him for it. There is an enormous recent scandal on this in the Atlanta public school system, going up to the former superintendent. The Atlanta Journal-Constitution did the kind of digging and reporting that is rare these days to document this story. Given the state of newspaper economics these days there are probably few papers that still have the resources and will to uncover a story like this. I would be surprised if this kind of cheating isn’t going on throughout the country. Is any criticism of unions completely off-limits on this site? The article also cites how this was fueled by ever increasing targets. My understanding of current public school funding in America is that if you don’t meet your targets you get your budget cut. Isn’t this setting up a system in which school have the choice of A) pray for a miracle B) Fail to meet the target, get your budget cut, fail to meet the next target (because you’ve got less resources now), get your budget cut, ……. C) Cheat. While it may be all good and noble to do the right thing, it may also be that the only way that those teacher would be capable of getting the necessary resources to ensure they could teach their students properly, was in fact to cheat. I’m not to certain how on/off base I may be. But this seems like a system of perverse incentives to me. You can criticize unions, CO2, poor immigrants, automobiles, GMO’s and anything else but they are ALL diversions from the root and proximate cause of our problems – the money system. Er, poker *is* a game of skill. How clueless are you people? I wrote the Freakonomics people off when they asserted there was no point to making ice cream at home (with kids, no less!). They thought it was a negative worth project. I think they are autistic and/or incapable of human emotion. Reminds me of Ayn Rand fanatics. This post is very much informative and at the same time has the same goals as ours. At Ecosol Global we offer R.E.D Teslagram to help people lessen harmful emissions. Thanks.